Southeast Asia is a region rich with legends and myths which hasn't been explored enough by writers, even those residing here. But this is probably partly because we don't have that many venues in which to share these stories. 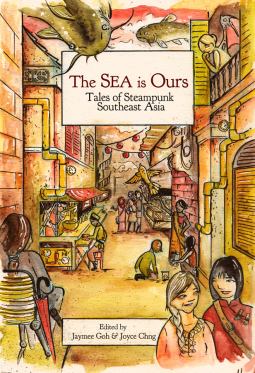 It goes without saying then that The SEA Is Ours, a steampunk anthology featuring writers from all over Southeast Asia, is a timely anthology that fills the need to showcase stories from authors we don't normally hear from. The two editors, Jaymee Goh and Joyce Chng, have made great choices in selecting the stories that went into this anthology. There were only a couple of stories that didn't really grab my attention, but that's par for the course for any collection of stories. It's rare that I find myself liking all the stories in an anthology. The ones that did really stood out for me were Timothy Dimacali's On The Consequence of Sound, which, rightly, is the opening story and features humongous giant whale catfish sweeping through the skies; Marilag Angway's Chasing Volcanoes which featured airships (my primary reason for loving the steampunk genre) and a fun, rollicking adventure worthy of the era of pulps and adventure serials; as well as Paolo Chikiamco's Between Severed Souls, a really fun steampunk twist on a Filipino legend. You may have noticed that all the stories I mentioned above were written by Filipinos. They really turned in great stuff and this anthology has piqued my interest in looking for more SFF written by them. Lots of other cool stories from writers from Southeast Asian countries worthy of your attention as well such as Olivia Ho's Working Woman and ZM Quynh's Chamber of Souls. All in all though, a fun book to read and a great addition to the canon that is world SFF. Truly worthy of your attention if you're a fan of well-written speculative fiction, steampunk or otherwise. The book releases on November 1st. This review was made possible courtesy of NetGalley. As a Malaysian though, I think it's a shame none of us managed to make it in but that just means we will have to work harder on our craft. And in case you're wondering, no, I didn't submit for this anthology.